NORMAN, Okla. (AP) – Oklahoma’s offense is on a record-setting pace heading into the Big 12 title game against Texas. 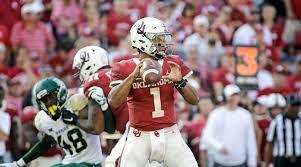 Heisman candidate quarterback Kyler Murray and his crew have had to be — the defense has been equally bad. The offense likely will need to carry the load again if the fifth-ranked Sooners are to win their fourth straight conference title in the Big 12 title game Saturday against ninth-ranked Texas.